Nick Brandt first fell in love with Africa in the mid-1990s when in Tanzania directing the video for the late Michael Jackson’s single Earth Song. 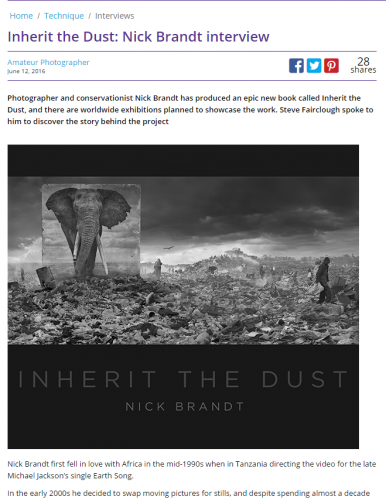 In the early 2000s he decided to swap moving pictures for stills, and despite spending almost a decade producing the book trilogy On this Earth, A Shadow Falls and Across the Ravaged Land – the clue is to read the titles out together – Nick still felt driven to highlight the plight of animals in East Africa. The result is Inherit the Dust, a striking collection of fine-art images that show large photographic panels of animals positioned and shot in landscapes where they had previously roamed, before mankind claimed and developed the land. Down a phone line from his California home, in a clear English accent, Nick explains: ‘Having worked non-stop for years, I was planning on having a break… but I was so disturbed by the escalation of devastation, I just felt, “You know, I still haven’t really covered it”. What I had done up until that point was not enough.